I want to write a full length article about this subject someday so this is going to be the pre-quel I suppose. Ever since my first trip to Africa and I got to shoot a rifle that had a suppressor attached to the barrel I knew it was something I had to have someday. It was the coolest thing I'd ever used up 'til then, and the most important effect of the silencer (something I'd never even thought about) wasn't the noise reduction, it was the recoil take-off. At least 85-90% of the felt recoil is obliterated by a suppressor! Don't get me wrong, it was very cool to have the blast percussion reduced too, making it easy on the ears for me and everyone close by whenever I pulled the trigger, but it's the recoil reduction that is the prize here. Fast forward several years and the state of Texas made it legal to use a suppressor on your rifle for big game hunting. When I heard this, I started thinking right away about a new rifle. With a suppressor, I could get something bigger like a 7mm-mag now and not worry about recoil. Heck, I could get a 300 ultra-mag if I wanted, something I swore I'd never shoot before the law change. It wasn't until I found out that 24 other states had also made it legal to use silencers when hunting that I made the move. I didn't want to pay the expense if I wasn't going to be able to use it in the western states on elk & mule deer. So I went to my local gun shop to get the wheels in motion. To own a suppressor, you first have to create a Trust, costs about $200. They took care of the paperwork and told me it'd take about 6 months for it to clear government approval. In 4 months, I got the call. I was a proud new owner of an Advanced Armament Corp. (AAC) Cyclone 7.62mm silencer which retails for about $1000. This was a model big enough for a .30 caliber gun if in case I get one someday. For now, I had them thread the barrel of my 7mm-08 so I could use it while I get a new barrel for my 7 mag. $160 later and it was ready to roll. 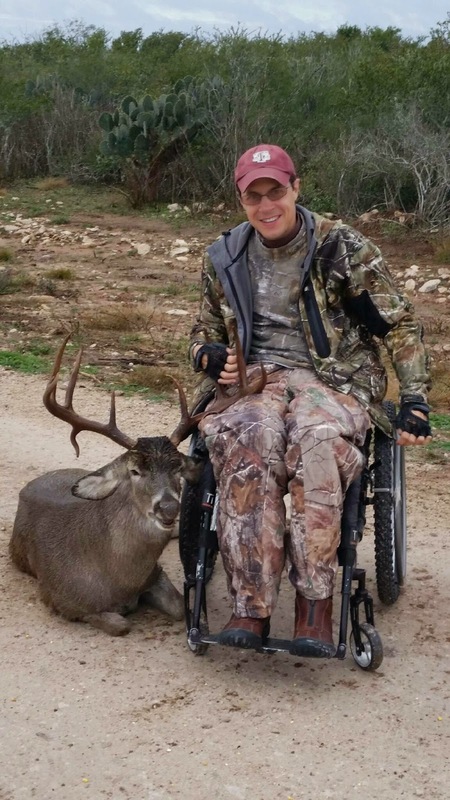 And if you read my first blog, my first 2 shots through it were used to take both of those deer in south Texas. I'd forgotten how cool it was to have a silencer on the barrel. You have this crack (like a 22 firing) and then you hear the bullet sizzling through the air until it hits, and there's zero kick! 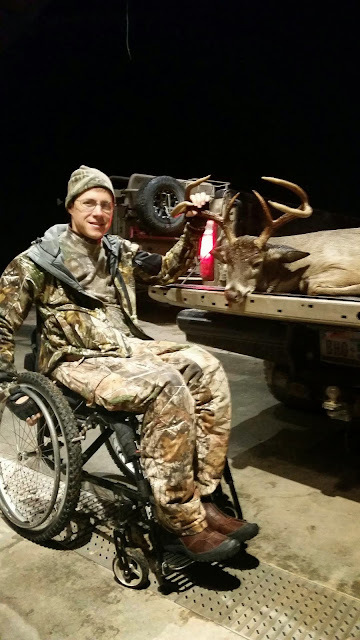 For a disabled hunter, that is a huge deal. I can't wait to screw it on my 7 mag someday. * It's removable so I'll only need one to use on multiple rifles. And it does make noise. When people hear the word silencer they think that it doesn't make any sound at all, well maybe that's true is you shoot special sub-sonic ammunition, but not when shooting high-powered rifles. It still goes bang, but not with nearly as much force as it used to. I can't wait to take it to the range. It's going to make sighting in your gun a joy to do without having to deal with recoil or ear plugs. It's easy to wake up early when you're in big deer country. Deer hunters will understand this. Most of the time I'm counting the minutes 'til the alarm goes off. It was cold, overcast & still light raining when Joey and I left camp. No hurry, it wouldn't be light 'til almost 7. A pleasant north wind was still blowing when we got to our spot, the kind that would chill you to the bone if you didn't have a cozy blind to roll into. Before I could see, Joey said there was a deer under the feeder but he couldn't tell how big. It was still way too dark. The last time he said that, it turned out to be a really nice 8 point that I missed last year. And I'd almost forgotten about it. This guy was an old 10 point that seemed more intent on eating corn than anything else. A big mature 8 did show up, but we weren't looking for a cull today. A beautiful young 9 and several does came and went throughout the morning, along with all kinds of other birds & animals to watch. It's amazing how much life the dry brush country can hold. Down the road, a nice young 10 showed up, the kind of deer that could really be something if he lives 4 more years. And when I put the binocs down I saw another one coming out behind him. A big one. First of all, this was going to be my last deer hunt of the season, first one for the new year though. And since I hadn't gotten to hunt but one time way back in October, I was itching to go. We got invited to a ranch south of Freer, Tx., in the famed brush country where I'd also be trying out my new AAC supressor that I had installed on my 7mm-08. It was cold and misty when we arrived, perfect deer hunting weather, and my guide Joey was waiting to take me out as soon as we got unloaded. 20 minutes later, we were parked next to a brand new, wheelchair trailer blind by Atascosa Wildlife Supply. Let me just say that I've been in a lot of blinds in my life that were supposedly accessible, but this one was done right. 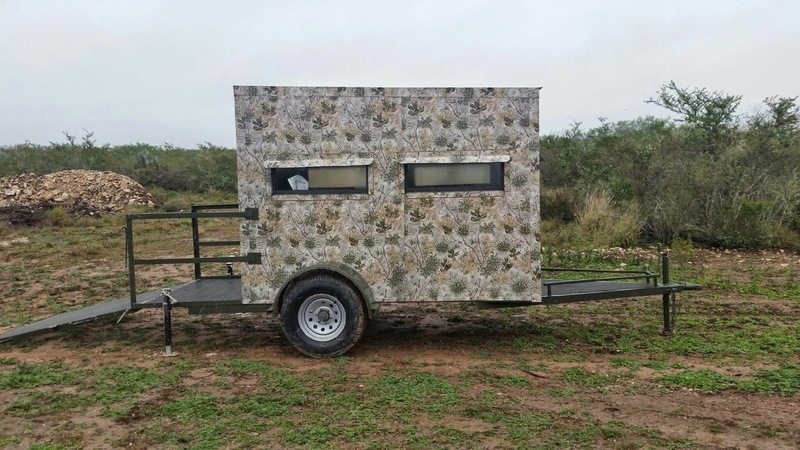 It's moblie, spacious (plenty of room for a chairbound hunter and a companion), the windows are the correct height and there's a ledge that runs around the entire inside for shooting off of. I was impressed. It was parked along the gravel road where we could also see down a scendero about 100 yds to a feeder. I knew it was going to be a great afternoon. We watched several good young bucks come and go, and finally settled on this one big cull buck to take out before it got too dark to see. He was chasing does all over the place but the last time he came out on the road I was ready for him. One shot, one kill on a big six! Hi everybody, after a 2 year absence from blogging, been spending all my time working on this new site & magazine, I'm coming back on the air. The site will be up soon and I wanted to get this started to keep y'all up-to-date on what we are doing at Able Outdoors in 2015 and also so you can follow me on some of the adventures we are planning. The seasons are coming to an end here, but if you're planning on going hunting out-of-state, January & February are the months to start figuring out where you want to go, what you want to hunt for and then submitting your applications to either the organizations in charge of the hunt or to the state's wildlife departments, or both. It sounds complicated I know, but it really isn't. Everything is done online these days and with a little help it's pretty easy to figure out. This week I'm heading down to south Texas to hunt on the famed Sweden ranch. I haven't gotten to deer hunt much this year so I'm uber-excited to be going, plus it's been cold & rainy for about a week and I'm just ready to get out of the house! I will be posting pics and updates here as we go so check back. It will be my first, and last, real deer hunt this season. I've been receiving some great stories already from challenged sportsmen across the country and I'm looking forward to reading more of them as we get ready to launch the magazine. I really want to try to get them all out eventually either on the site or in print so please feel free to send us all your ideas. Your stories are going to be what makes this magazine go. Okay that's enough for now. It feels good to be plugged back in and I'm looking forward to doing this thing!